William Penn (14 October 1644-30 July 1718) was an English colonial leader. He was given what would become the US state of Pennsylvania by King Charles II as a debt to his father. 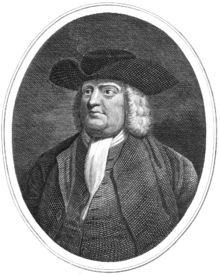 Penn was a member of the Religious Society of Friends. Penn and his wife were made honorary United States citizens in 1984 by US President Ronald Reagan. He was friends with George Fox. This page was last changed on 8 January 2017, at 17:31.